People - Martin Luther King Jr.
Martin Luther King, Jr., famously known for his speech that began with the words "I have a dream," was a clergyman in the United States of America (USA) who contributed greatly to the advancement of civil rights in a profoundly important history-changing way that revolutionized society toward a direction of progressive liberalism. 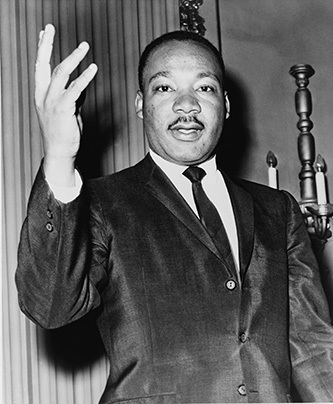 His role as a theist was supplanted by what he did with his life in promoting freedom and justice, and incidentally starting the revolution of civil rights was his most meaningful contribution to humanity which clearly transcended all aspects of culture, religion, etc., aimed primarily at the eradication of injustice that ultimately changed previously racist laws. As a man of genuine integrity who valued honour, peaceful conduct, equality (non-discrimination), and freedom (in particular), all of which, from the standpoint of natural sociology, Martin Luther King Jr. worked tirelessly for as parts of his cause from a constant position of integrity. Being one of the most important figures in American history, Martin Luther King, Jr. was unquestionably an excellent role model, and should be celebrated for his accomplishments as much as for what he encouraged; critical thinking, education (that also challenges its students), and justice, are some of his ideals which were often reflected in many of his quotations -- these ideals are still applicable today, and most are critical building blocks for the long-term success and health of any modern society.